I use the beef that is left from making my homemade beef stock in this recipe. You probably won’t have that. Use leftover pot roast without the gravy or even browned ground beef. It really doesn’t matter. You just need cooked beef. 1. Preheat the oven to 375°. Lightly mist an 8 x 8 inch baking dish with cooking spray. 2. In a medium bowl, stir together the cottage cheese, egg, cilantro, and 1/2 cup of the shredded cheese. Set aside. 3. 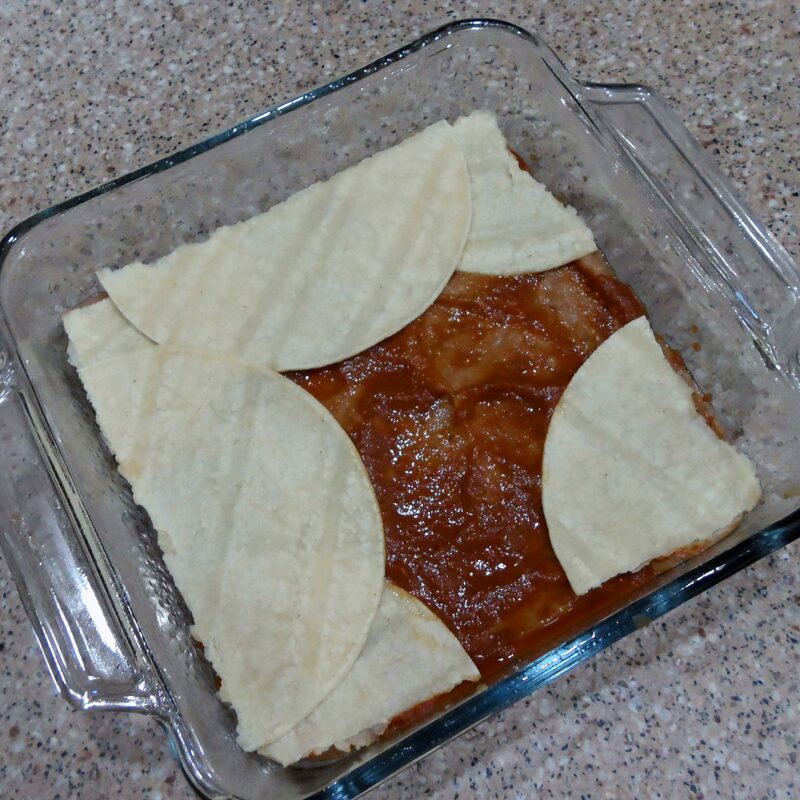 Spread 1/4 cup enchilada sauce in the bottom of the baking dish, then cover with 4 corn tortillas, cut to fit. 4. Stir the refried beans until smooth and spreadable. You may need to add a little water to the beans to achieve the right texture. Spread the beans over the first layer of tortillas and drizzle with 1/4 cup of enchilada sauce. 5. Add a second layer of 4 tortillas and spread the cheese mixture evenly over this layer. 6. Add a third layer of tortillas. Stir 1/2 cup of enchilada sauce into the beef and spread this mixture over the tortillas. 7. Top the beef with one more layer of tortillas, then cover completely with the remaining sauce. Sprinkle on the remaining shredded cheese. 8. 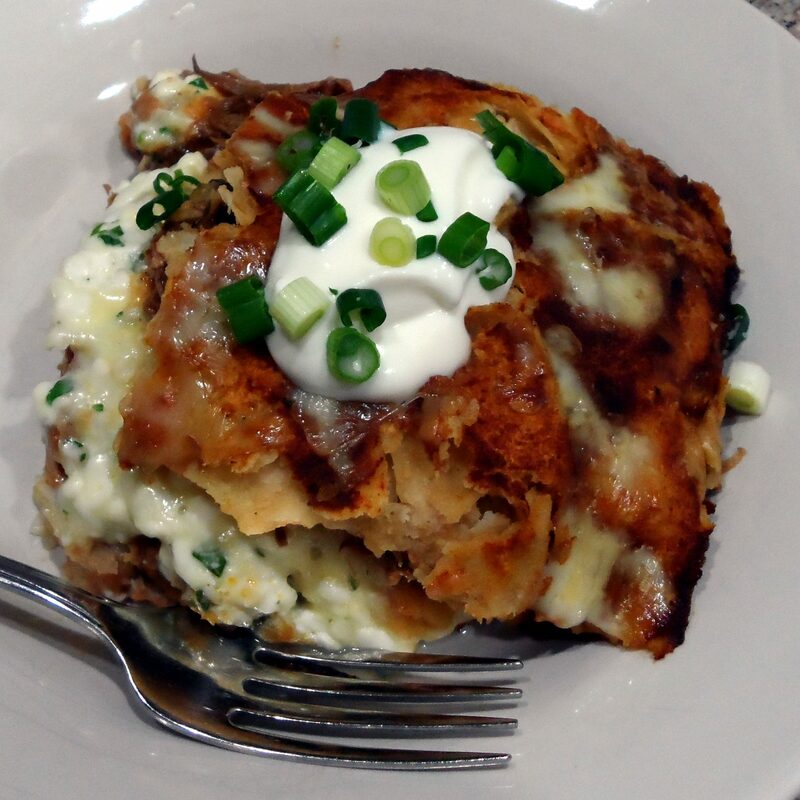 Cover the casserole with foil and bake in the preheated oven for 20 minutes. Uncover and bake 10 to 15 minutes longer, or until the cheese is melted and the casserole is hot. Let stand a few minutes before cutting to serve. 9. Top with your choice of condiments and green onions.